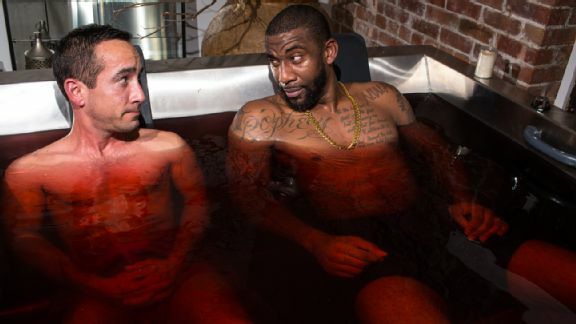 Amare Stroudemire of the New York Knicks has opened up about his unconventional ritual of bathing in a tub of red wine, by inviting a reporter to take part. Speaking to ESPN’s Sam Alipour, who can’t resist hopping into the tub with Stroudemire to conduct his interview, the basketball player explains how he is a regular visitor to Aire Ancient Baths in New York, believing its “Red Wine Ritual” to increase circulation in his red blood cells. The treatment includes a 30 minute red wine soak enjoying the “antioxidant benefits and relaxing experience of soaking in red wine”. The website notes that the red wine is imported “directly from Spain”. This is followed by a “four-handed” massage that lasts 90 minutes using a “special wine oil essence” which promises help the recipient detox and de-stress and boost circulation. The treatment is topped off with a 90 minute “thermal bath experience” featuring and ice pool (46ºF), cold pool (61ºF), warm pool (97ºF), hot pool (102ºF), as well as a steam room, propeller-jet bath (97ºF), and salt-water pool. Watch the complete interview here. Medicare coverage? Service include BYO, corkage fee?